154 pp, black and white with color cover. 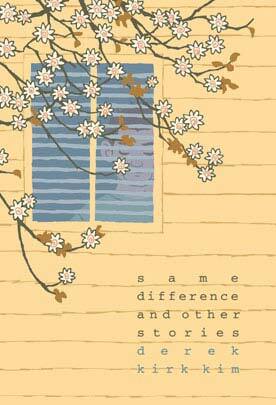 Same difference and Other Stories is a refreshing compilation of Derek Kirk Kim’s works ranging from 2000-2003, works such as Pulling, Hurdles and Same Difference (a personnal favorite). The book shows the a amazingly wide array of styles and creativity, a pleasantly simple and colorful chiaroscuro (Omg, that’s pretty contradictive! But then again, isn’t Same Difference a tad similar? Wink. Wink.) - to whomever would happen to happen onto his work the same way I did. An elegant demonstration of how web-bound comics can transcend to libraries. A mongering fan of Kim’s work myself – ever since I stumbled across his website one midsummer night - his witty, litterary-yet-human-stories-with-a-tinge-of-introspection cocktail is a great example of how an involving story can remain simple, humoristic and efficient. Derek Kirk Kim’s korean-american art remains simple and beautiful, taking as many shapes as his tales goes. The only possible stone standing out in this field is how different some stories are from those found on the website. Those long travelling strips found on the website can’t possibly fit in a single page, thus stories like Interview with a Human, or The Sound, have been “broken down to fit book screen” (Same difference between going to the movies versus a video). While not a huge loss, there’s this little something inherently different for those who saw them on Kim’s website. Overall 8 out of 10. Cherry Garcia rocks.